Estate agents on South End in South Croydon. 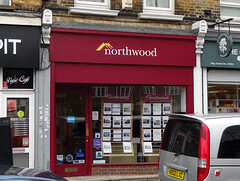 It was previously called Chilcott White photo, but became Northwood some time in 2018 or early 2019. According to a projecting sign on the frontage photo, it was once called Chilcott, White & Co.
Last edited 2019-02-07 14:47:36 (version 27; diff). List all versions. Page last edited 2019-02-07 14:47:36 (version 27).